Online safety and digital citizenship. The Inquiry curriculum is a companion curriculum to EasyTech and consists of a library of units that provide kindergarten through eighth grade students with the opportunity to use applications and technology skills anchored in a real-world context. 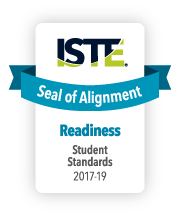 The EasyTech and Inquiry curricula successfully underwent the International Society for Technology in Education (ISTE) Seal of Alignment review for Readiness and Proficiency. 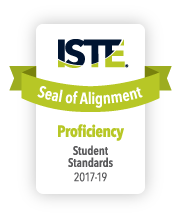 Reviewers determined that both the EasyTech and Inquiry curriculum help build foundational technology skills and provide opportunities to practice the skills needed to support the ISTE Standards for Students. Reviewers found that EasyTech provides an opportunity for students to learn key technology and digital skills through engaging activities designed for success, and that the Inquiry resource helps students then apply their digital skills for learning through additional project-based learning opportunities. "By using EasyTech, students can build foundational knowledge critical to becoming productive citizens. The Inquiry curriculum then challenges students to apply their technology knowledge through complex tasks." 1.c. Use technology to seek feedback that informs and improves their practice and to demonstrate their learning in a variety of ways. 1.d. Understand the fundamental concepts of technology operations, demonstrate the ability to choose, use and troubleshoot current technologies and are able to transfer their knowledge to explore emerging technologies. 2.a. Cultivate and manage their digital identity and reputation and are aware of the permanence of their actions in the digital world. 2.b. Engage in positive, safe, legal and ethical behavior when using technology, including social interactions online or when using networked devices. 2.c. Demonstrate an understanding of and respect for the rights and obligations of using and sharing intellectual property. 3.c. Curate information from digital resources using a variety of tools and methods to create collections of artifacts that demonstrate meaningful connections or conclusions. 4.a. Know and use a deliberate design process for generating ideas, testing theories, creating innovative artifacts or solving authentic problems. 4.b. Select and use digital tools to plan and manage a design process that considers design constraints and calculated risks. 4.c. Develop, test and refine prototypes as part of a cyclical design process. 5.b. Collect data or identify relevant data sets, use digital tools to analyze them, and represent data in various ways to facilitate problem-solving and decision-making. 5.c. Break problems into component parts, extract key information, and develop descriptive models to understand complex systems or facilitate problem-solving. 5.d. Understand how automation works and use algorithmic thinking to develop a sequence of steps to create and test automated solutions. 6.a. Choose the appropriate platforms and tools for meeting the desired objectives of their creation or communication. 6.b. Create original works or responsibly repurpose or remix digital resources into new creations. 6.c. Communicate complex ideas clearly and effectively by creating or using a variety of digital objects such as visualizations, models or simulations. 7.d. Explore local and global issues and use collaborative technologies to work with others to investigate solutions. 7.a. Use digital tools to connect with learners from a variety of backgrounds and cultures, engaging with them in ways that broaden mutual understanding and learning. 7.b. Use collaborative technologies to work with others, including peers, experts or community members, to examine issues and problems from multiple viewpoints. 7.c. Contribute constructively to project teams, assuming various roles and responsibilities to work effectively toward a common goal. 1.a. Articulate and set personal learning goals, develop strategies leveraging technology to achieve them and reflect on the learning process itself to improve learning outcomes. 1.b. Build networks and customize their learning environments in ways that support the learning process. 3.b. Evaluate the accuracy, perspective, credibility and relevance of information, media, data or other resources. 3.d. Build knowledge by actively exploring real-world issues and problems, developing ideas and theories and pursuing answers and solutions. 4.d. Exhibit a tolerance for ambiguity, perseverance and the capacity to work with open-ended problems. The EasyTech resource helps build foundational technology skills needed to support the ISTE Standards for Students. The Inquiry resource offers a flexible implementation plan and opportunities to practice the skills and knowledge necessary to meet the ISTE Standards for Students.